History: Sold to the Turkish Navy in 1958 being renamed Maresal Fevzi Cakmak. At 02.11 hours, U-515 fired two torpedoes and hit the escorting HMS Marne (G 35) (LtCdr H.N.A. Richardson, DSO, DSC, RN) in the stern. 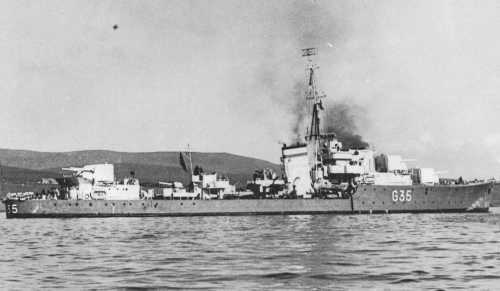 The badly damaged destroyer was screened by HMS Venomous (D 75) (Cdr H.W. Falcon-Steward, RN) until she was taken in tow to Gibraltar by HMS Salvonia (W 43), escorted by HMS Jonquil (K 68) (LtCdr R.E.H. Partington, RNR). The ship had lost the entire stern and temporary repairs at Gibraltar took three months. HMS Marne (G 43) was then towed to the UK and returned to service in January 1944 after repairs at Swan, Hunter & Wigham Richardson Ltd, Sunderland.